Janet S. Carpenter, associate dean for research at the Indiana University School of Nursing, has released a three-minute video on YouTube as part of her “Hot Flashes? Cool!” channel. 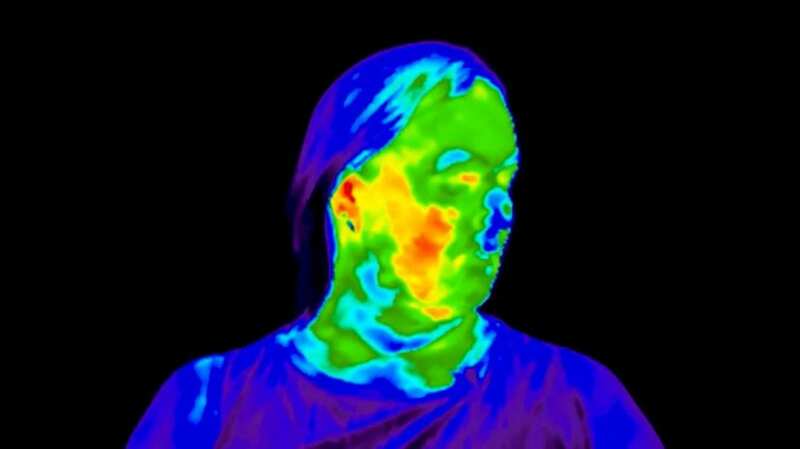 Carpenter used a thermal camera to show internal temperatures a volunteer experienced during a hot flash. “Hot Flashes? Cool!” is an educational art exhibit Carpenter created to refute myths, provide accurate and culturally appropriate information, prevent use of unproven treatments, and spur dialogue about menopausal hot flashes. The exhibit comprises multiple pieces of two- and three-dimensional art, music, and film. The exhibit’s concept graphics traveled to Vancouver, British Columbia; San Diego; and Indianapolis in 2018. They are scheduled to travel during spring 2019 to The Art Gallery at Indiana University Northwest in Gary and South Dakota State University in Sioux Falls. Carpenter has worked with the IU Innovation and Commercialization Office to copyright descriptions of exhibit pieces and to trademark the exhibit art and logo.